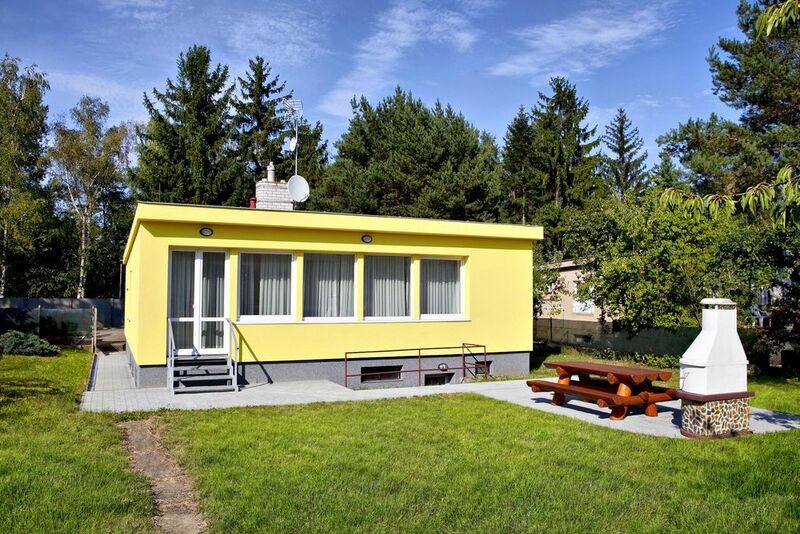 Your vacation object: The bungalow is placed on a 1000 sqm and an enclosed garden property with meadow and trees. The landlord does not live in the house or on the property. The facilities are at your disposal for exclusive use. Relax outdoor with parasol and garden furniture. Barbecue possibilities are available. The campfire place promises romantic evenings. Your holiday house: Your bungalow consists of 1 floor, 4 rooms (from which 3 bedrooms), is 150 sqm and can accommodate up to 7 persons. Smoking is not permitted inside the rooms. On colder days your bungalow can be heated with central heating (gas). The entrance leads directly in the porch with wardrobe. The rooms are divided as follows: Living/bedroom 46 sqm and with 1 additional bed, fireplace, lounge, dinette, TV and radio. The dinette offers space for 6 persons. You have access to the terrace. Kitchen as intersecting room, 10 sqm and with dinette, dishwasher, gas stove, oven, exhaust hood, refrigerator (freezer), microwave, coffee machine and electric water boiler. Bathroom 12 sqm and with bathtub with shower, shower, 2 washbasin, WC, bidet, hairdryer and washing machine. Bedroom 12 sqm and with 1 double bed, dinette, TV and radio. 2 Bedroom each 10 sqm and with 2 single beds, dinette, TV and radio. In addition, your bungalow is equipped with baby bed and electric iron. Pets: nicht erlaubt. bathroom (12 sqm) with bathtub with shower facilities, shower, 2 washbasin, WC, Bidet, hair dryer and washing machine.